In Vietnamese culture, the market place is an important meeting place, not simply a place for trading, and it remains the same today. There is not one child who does not want their mother to take them to the market. Why? Because many people live in remote areas and work hard in the fields or elsewhere to make a living and have few opportunities to meet friends, relatives or neighbors. A market is a great place to fulfill those needs. Without a marketplace, life could be quite boring. Communities therefore established markets for reasons beyond shopping: young people wanting to meet each other to find their life partners; the need to belong to a community and share handicrafts and fashion ideas; and for women to show off their beauty and talent. People often go to a great deal of effort to travel long distances over hills, through valleys and even across borders to reach the market. There is always a lot of excitement and joy associated with the market place environment. 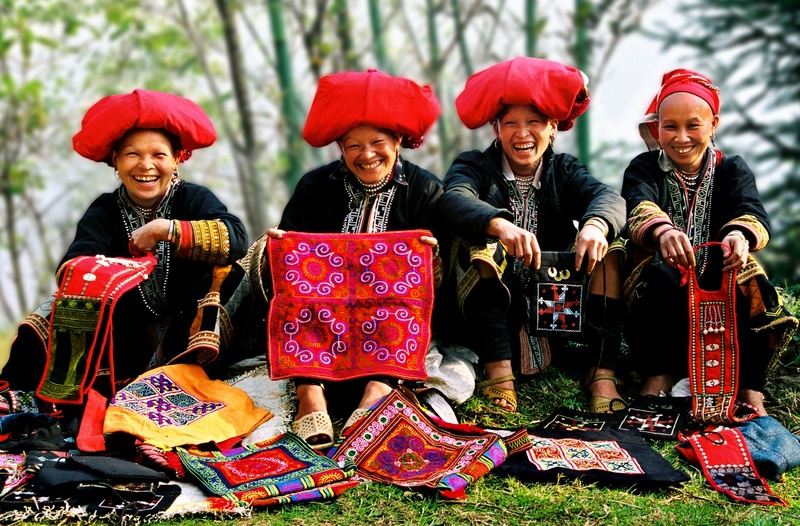 This trip will introduce the most colorful markets of the tribes living in northern Vietnam. You will encounter many interesting people and visit their villages located at the foot of Vietnam’s highest mountain, Mount Fansipan. 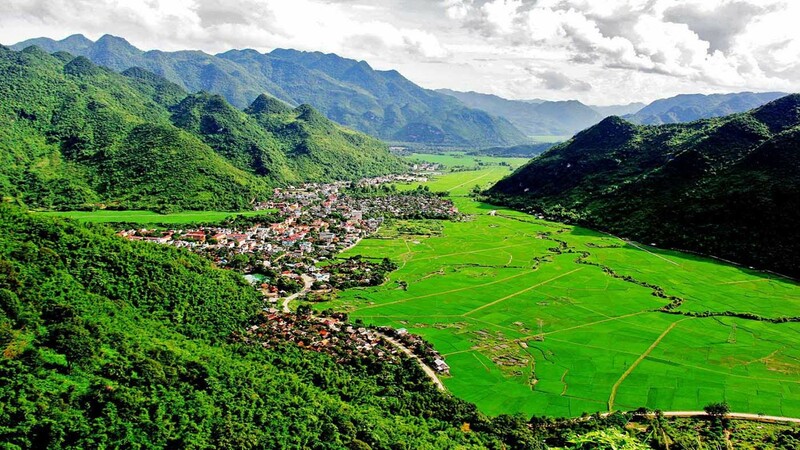 The adventure starts with a drive from Hanoi to the mountain town of Bac Ha in the far north of the country. 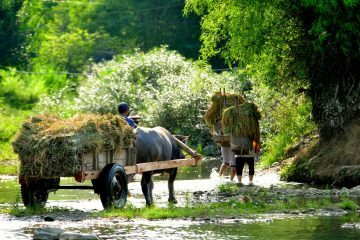 The journey to Bac Ha will take the best part of the day. The drive is worthwhile though, as the scenery on the journey northward into the highlands is both dramatic and breathtaking. Arriving in Bac Ha late in the afternoon, check into the hotel and take a short walk around the mountain town. Overnight in Bac Ha. Following breakfast drive 12km along a scenic road to Can Cau Saturday Market, home to the Flower Hmong hill tribe people. 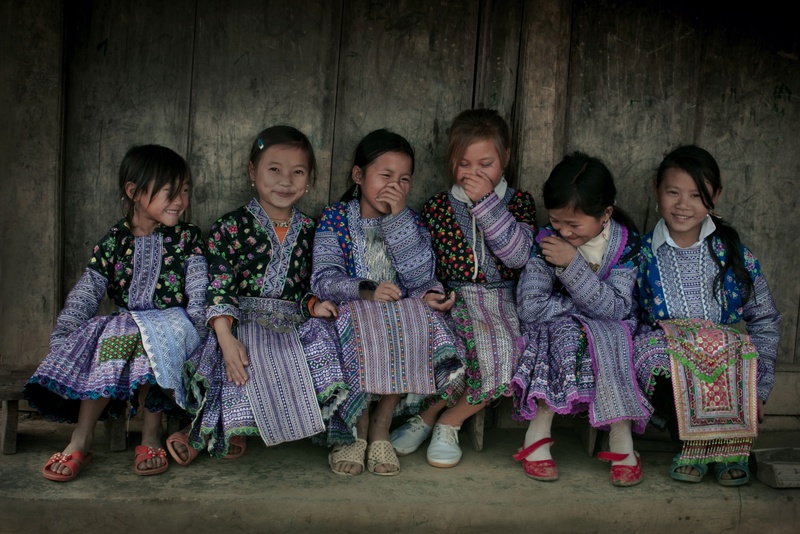 The very colorful Flower Hmong people converge from distant villages to trade and exchange goods, such as farm produce, Tho cam (indigo clothes), dogs, cats, pigs and horses. Local people wear their best clothes and young men and girls come from the surrounding villages to meet each other. This is a golden opportunity for any photographer, as the diverse colors on display are truly magnificent. Return to Bac Ha town for lunch at a local restaurant and then walk to the Hmong King’s palace or Hoang A Tuong, a unique construction which harmonizes Asian and European architectural styles. 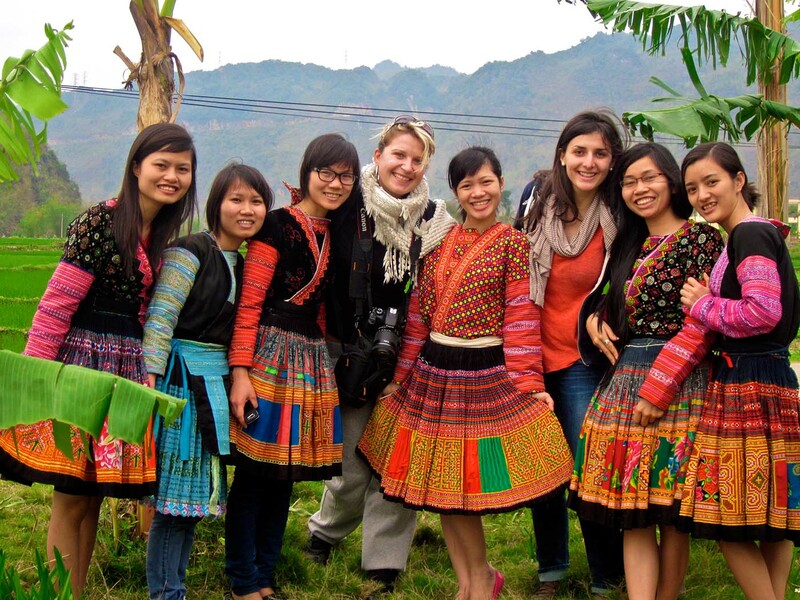 This is followed by a visit to the Pho village of the Hmong people where you have the opportunity to mingle with the locals and taste their famous home-made wine. Dinner at a local restaurant and overnight in Bac Ha. The Sunday market transforms this quiet mountain town into an exciting and colorful place. Bac Ha Sunday market is a trading center and meeting place for couples, friends, and relatives, and it is a typical weekly activity for the Hmong and other minority groups such as the Black Dao, Tay and Nung. Local products for sale or barter at the fair are carried on horseback and adventurous gastronomes can try “thang co” or blood porridge, a favourite dish of the Hmong and other local people. 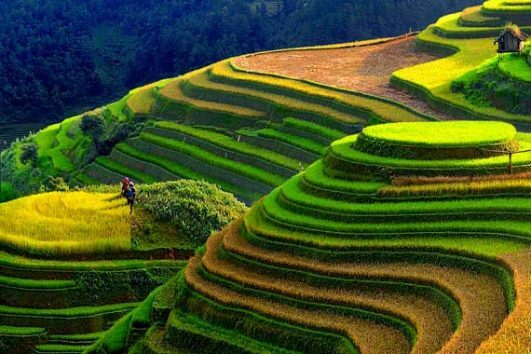 Leave Bac Ha for Sapa and en route visit the border town of Lao Cai and the border gate which links Vietnam with Yunnan Province in China. Rest of day at leisure in Sapa. 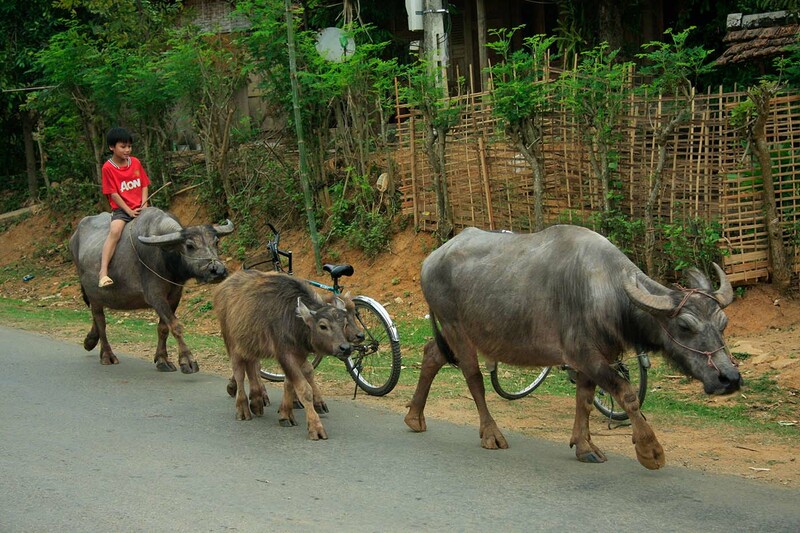 Enjoy a full day trek from Sapa town along buffalo paths and trails and through several hill tribe villages. This is an absolutely spectacular walk through stunning scenery inhabited by some of the friendliest people. Stop for lunch on the way before visiting Ta Van village, inhabited by the Day ethnic minority. Return to Sapa by car for overnight. 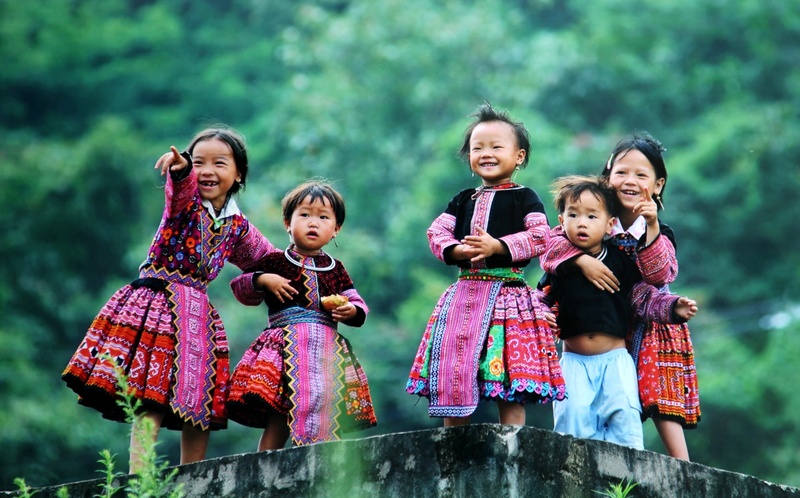 In the morning leave Sapa for Phong Tho town located in the Lai Chau valley, where the Thai ethnic minority people have lived for centuries. On the way stop to visit the Silver Waterfall and the Heaven Gate on the O Qui Ho pass where you may have a chance to view the peak of Mount Fansipan. 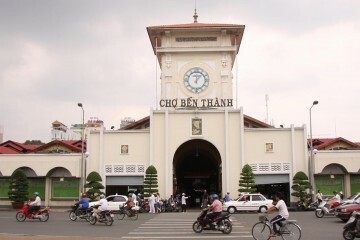 After arriving in Phong Tho discover the town, local market and visit some villages of the Thai or Ha Nhi people. Overnight in Phong Tho. After breakfast drive to Dien Bien Phu, a 4-hour journey through dramatic scenery and arrive by midday. The name Dien Bien Phu will always be linked with a historic battle, for it was here that Viet Minh soldiers overran a French garrison on May 7, 1954 and ended French colonialism in Indochina. To achieve this legendary victory, Vietnamese forces under the command of General Vo Nguyen Giap dismantled heavy anti-aircraft guns, lugged them up the steep slopes overlooking the town of Dien Bien Phu and reassembled them. Encircled by artillery, the French were cut off and could not receive supplies or reinforcements. In the afternoon visit the old battle field, A1 hill and Dien Bien Phu Museum. Overnight in Dien Bien Phu. After breakfast set out for Son La which is in quite a remote area, and as a result some of the roads are pretty bumpy. You will encounter few people along the way so will be able to enjoy in solitude the unspoiled and dramatic scenery en route. On arrival visit the former French prison and Son La Museum. Overnight in Son La. After breakfast take a 4-hour scenic drive to Mai Chau valley stopping at Moc Chau plateau for a visit to the tea plantation and a cup of tea. 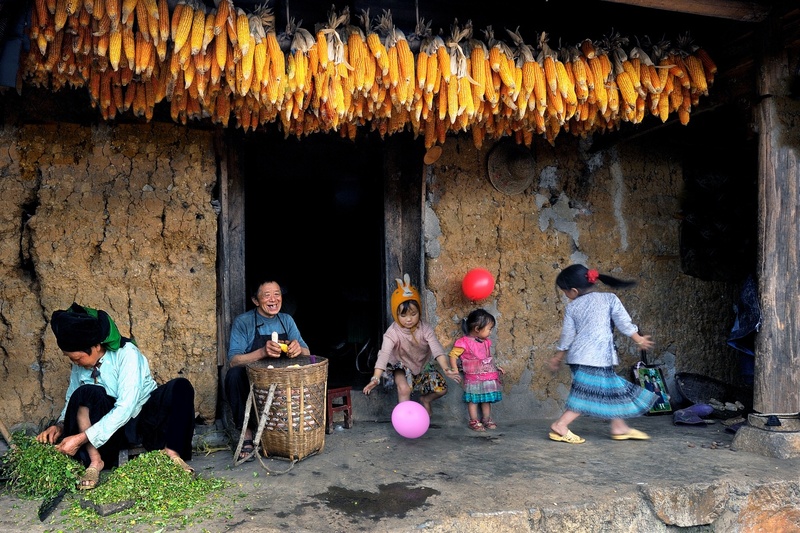 Upon arrival in Mai Chau valley you will be welcomed into the home of one of the White Thai ethnic people for lunch. 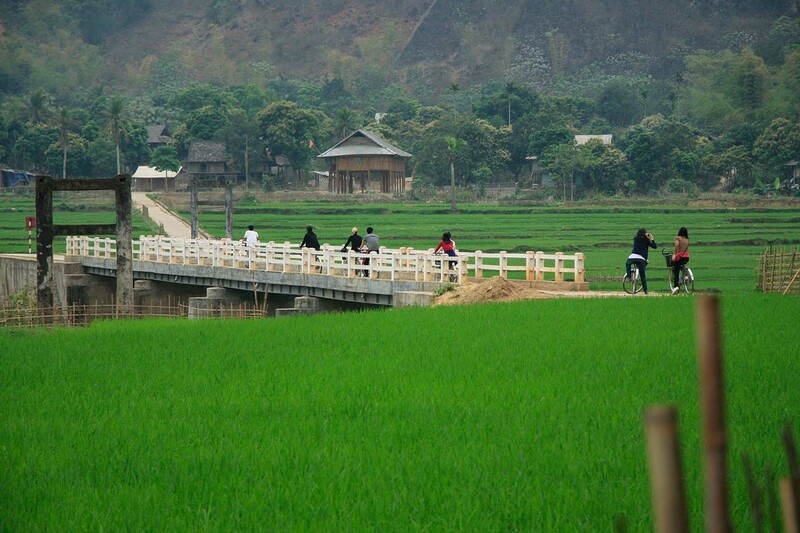 Enjoy your free time to explore several neighboring villages or cycle along the rice field paths and meet local people. Overnight home stay in a traditional stilt house. Wake up to the sounds of the village: roosters, early morning vendors and people’s voices. After an early breakfast bid farewell to Mai Chau and its friendly people and return to Hanoi, stopping to visit a Muong ethnic minority village in Hoa Binh province. End of services. 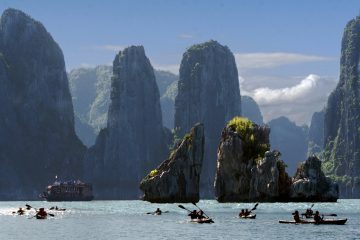 My group enjoyed the whole experience of travelling around northwest Vietnam. The tour is excellent. The meals are good with plenty of local food, especially the pre-arranged dinners which are very tasty. 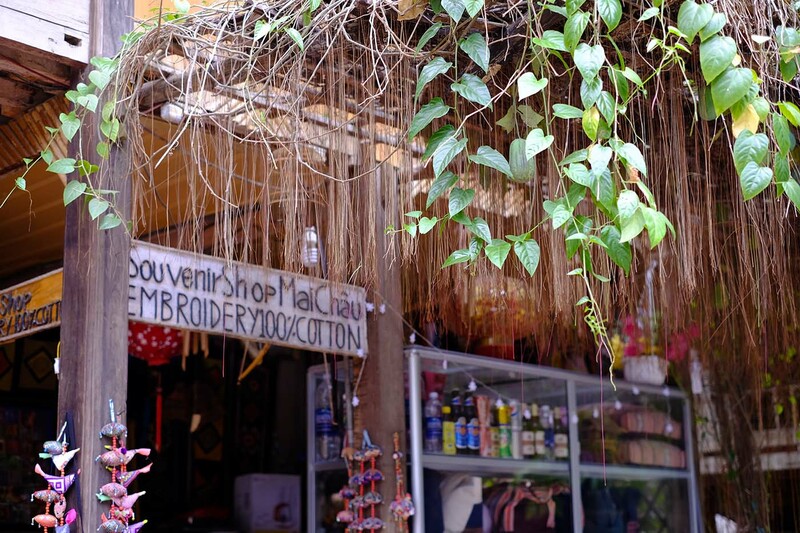 It is really worthwhile to meet the local ethnic people and experience their lifestyle, traditional costumes, language and particularly the markets. nt basis. Payment can be made either using a major credit card as Visa, Mastercard and American Express Credit Card without credit card transaction fee (3.3% fee for Visa, Mastercard or 4% for American Express Credit Card). Payment also can be made by bank transfer with the bank transaction fee to be paid by the client at their end. Deposit of $100 (USD) per person is required upon the confirmation of services. 30-59 days before arrival: 5% of total booking charge. Luxury Travel Co., Ltd. is not responsible for any loss, injury or damage sustained by passengers. Additional expenses incurred due to delays, accidents, natural disaster, political actions and unrest must be borne by the passengers. Passengers are required to have full travel insurance. Airline schedules and local conditions may affect accommodation and itineraries. Should this occur, Luxury Travel Co., Ltd will endeavor to substitute a suitable arrangement of similar value. Participation on any tours implies full agreement to the above conditions by all parties involved. Luxury Travel Co., Ltd. strongly advises that you purchase a comprehensive travel insurance policy to cover all aspects of your tour: the loss of deposits through cancellation, lost of baggage and personal items, personal injury and death. A waiver must be signed if insurance is declined.